My husband is working late tonight and has been all week. I feel like I have hardly seen him! 😦 I wanted to do something special for him because he had been working so hard. 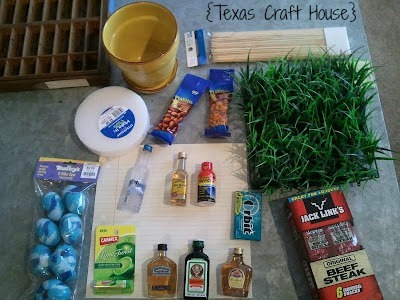 I saw an idea on Pinterest about using tiny liquor bottles to tape onto skewers and placing into a basket. 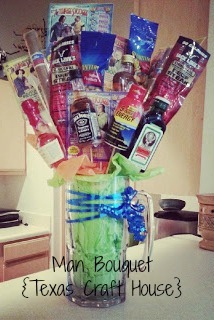 It’s called, “The Man’s Bouquet.” Instead of flowers or roses, they get all of their favorite things. The best part about this gift is that you can personalize it to fit your husband’s, dad’s, brother’s, friend’s favorite things. Below is a picture of my materials. I bought a normal flower-pot (which my husband doesn’t know yet but I will be taking back to put flowers in later, I just didn’t want to get something we’d throw away after this). I also got: peanuts, grass filler, a foam disk, wooden skewers, variety of liquor bottles (small), a 5 hour energy shot, gum, beef jerky, chap stick (my husband is obsessed), and scratch offs. I also have a picture of scrapbook paper and camo-eggs in the picture but I ended up not using them. I thought it would be cute to put sweet notes or handwritten ‘coupons’ inside the eggs for him to open, but after putting this craft together there was no room for them.